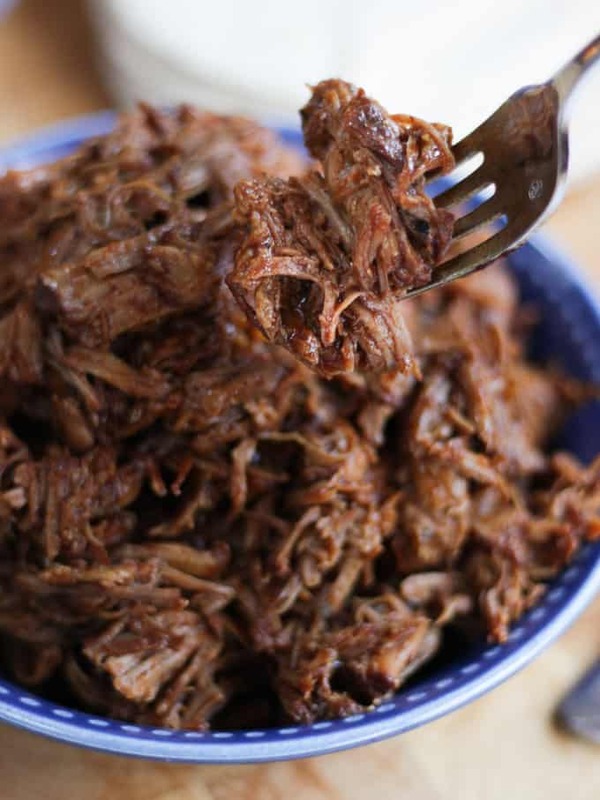 The ultimate Instant Pot Pulled Pork Recipe – A simple tasty rub gives a real depth of flavour to your pork shoulder and helps to create an easy, sticky and delicious homemade barbecue sauce. This is a winning base for so many meals. This pulled pork freezes well too. It was inevitable. I would eventually buy an Instant Pot. Have you seen them? They are everywhere on Pinterest at the moment. It turns out, with good reason. They are a bit of magic. Okay, not really. They are an electric pressure cooker, simple to use, economical and they cook so many dishes in super short time. 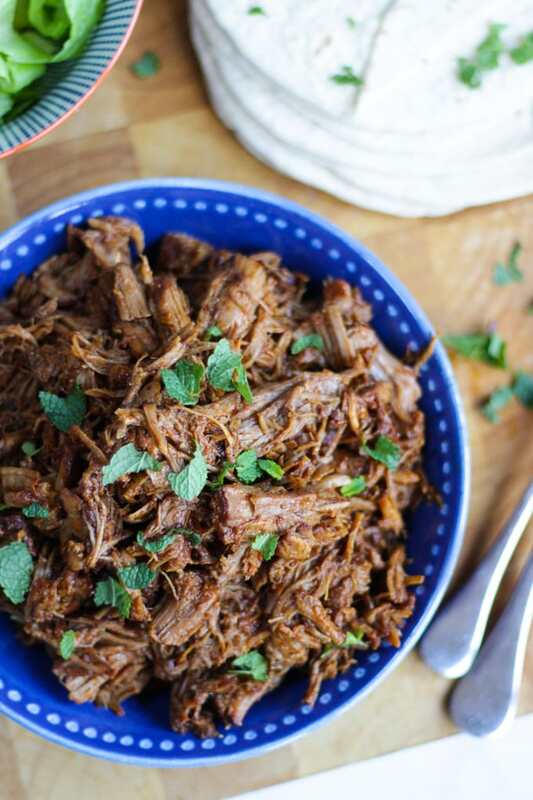 This Instant Pot Pulled Pork is my most successful recipe in the Instant Pot so far. Meltingly tender and soft pork shoulder, with a tasty rub, cooked to perfection in about an hour. Hurrah for new kitchen investments when they are as tasty as this. George and Harri are not quite sure about the new gadget, they have asked if it’s some kind of spaceship and were slightly disappointed when I had to explain it wasn’t. They did love the Instant Pot Pulled Pork though. It’s so soft that George even managed to eat it with two front teeth missing! 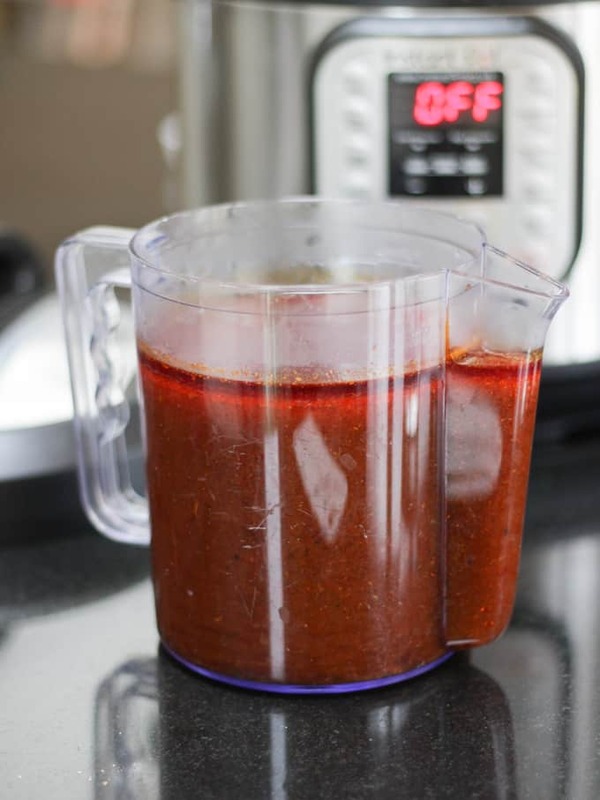 It starts with a simple but tasty dry rub on pork shoulder pieces, brown them off using the ‘saute’ function of the Instant Pot. Then add some basic barbecue sauce ingredients (white wine vinegar, tomato puree and honey), pressurise and leave to cook. I then pour the liquid into my nifty gravy separator jug (similar one here for £6 on Amazon). It makes it really easy to remove the meat fat. I think one of these jugs is a brilliant investment if you are buying an Instant Pot. It means that it’s easy to cook cheaper cuts of meat (which tend to be more fatty). You get the benefit of deliciously soft, slow cooked meat and yet still remove the fat afterwards. I put the sauce back into the Instant Pot on ‘saute’ mode (or you could pop it into a pan on the hob which would be slightly quicker) and let it bubble away and reduce. 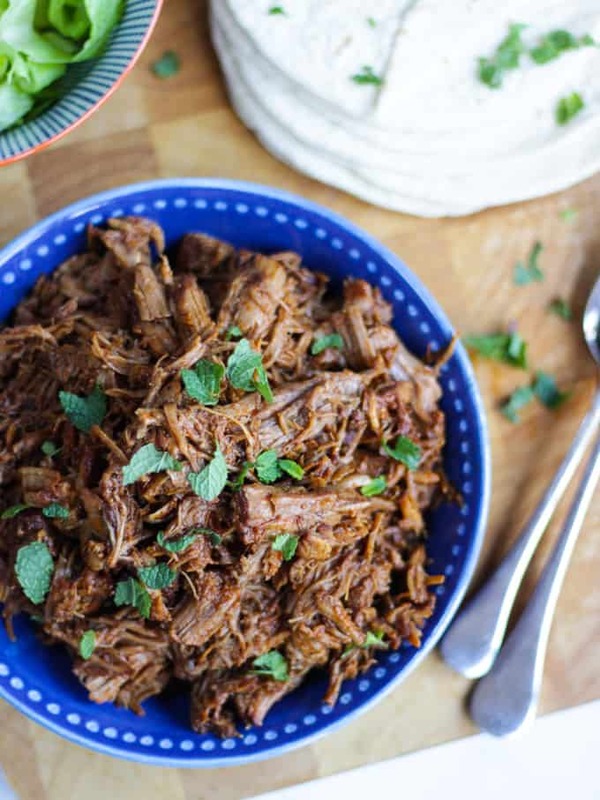 Add the sauce to the shredded pork and there you have it, the most delicious, tasty and really quite healthy Instant Pot Pulled Pork. This recipe makes a BIG batch, it’s great for feeding a crowd. Alternatively, you can freeze it in batches as I do, to pull out when you need a base for an easy meal. 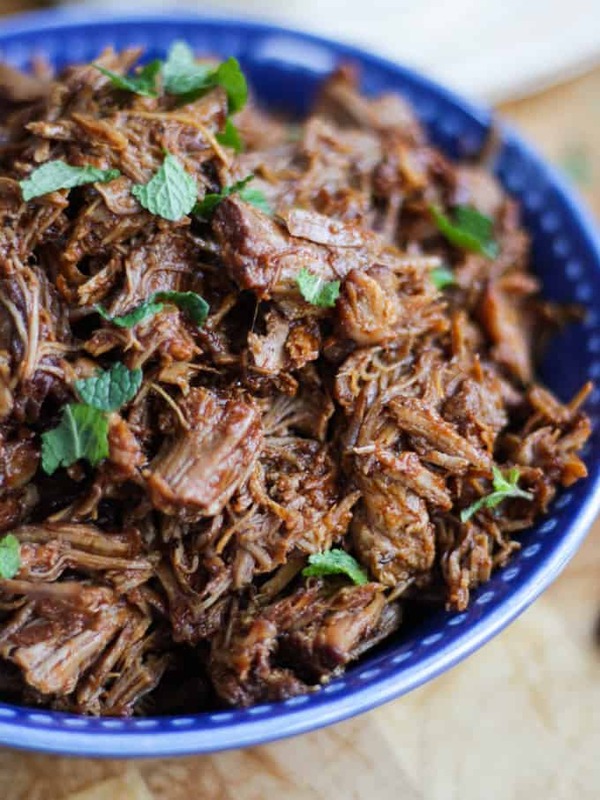 What kind of meat do you use for Instant Pot Pulled Pork? 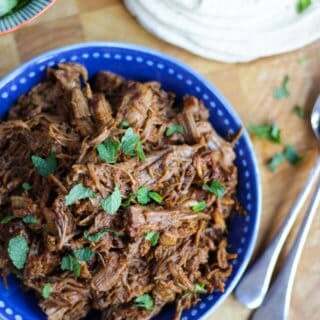 I have used pork shoulder in this recipe. It’s cheaper than pork loin and the fatty stripes through the meat mean it lends itself very well to this kind of cooking. I used a free range pork shoulder (like this one from Ocado) and it always works well. You could use a pork loin for this recipe but it just doesn’t really have enough fat. I think it’s much better to use a more economical cut like shoulder and then drain the excess fat. 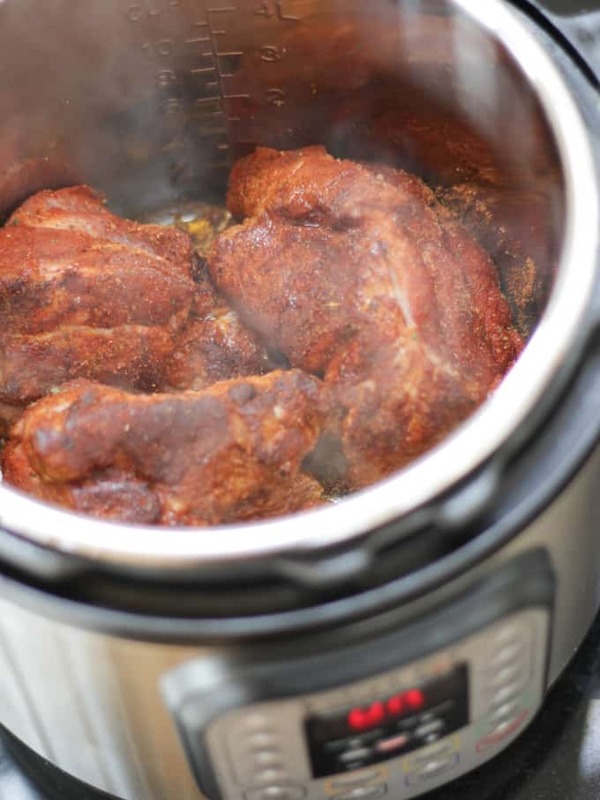 How long do you cook a pork shoulder for in the pressure cooker for pulled pork? 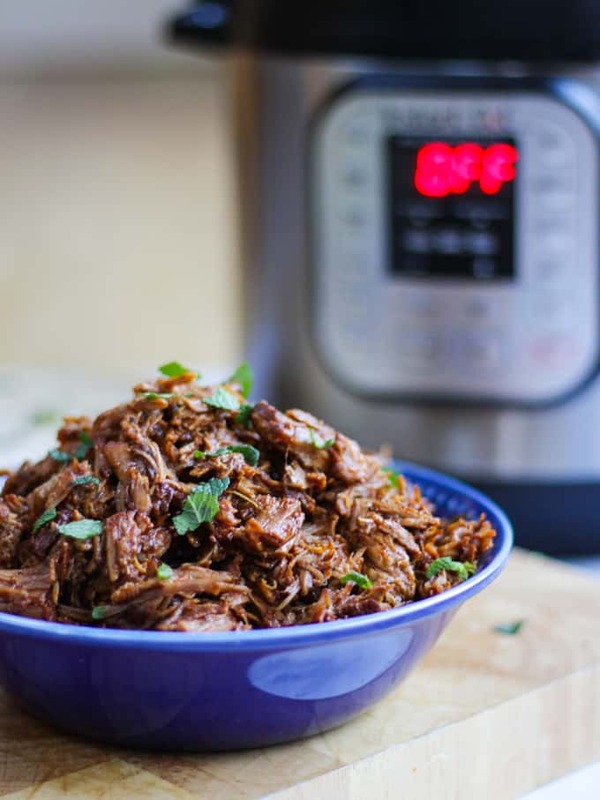 For this recipe the pork shoulder needs 60 minutes of pressure time in the Instant Pot. However, does this mean it actually takes 60 minutes? No! This has taken me a while to get used to with the Instant Pot. When working out how long it will take you to cook something, you need to factor in the time for the Instant Pot to come up to pressure and also for it to release. How long does the Instant Pot take to come up to pressure? It can take between 5 and 30 minutes for the Instant Pot to reach pressure. You’ll know when it has as the timer will count down in the display. Be sure to scrape the bottom of the Instant Pot as directed in the recipe. If there’s lots of ‘stuff’ stuck to the bottom it can slow this down. How long does it take for the Instant Pot to release pressure? You can manually release the pressure from the Instant Pot which obviously stops the cooking immediately OR you can allow it to slowly release the pressure naturally. To do this you just wait for the timer to stop cooking and leave the Instant Pot. Eventually the float valve will drop and the lid release. The important thing is, if a recipe calls for a natural pressure release, this is part of the cooking time so do factor it in. 60 Minutes doesn’t mean 60 minutes with an Instant Pot! What to serve with Pulled Pork? Bread rolls, or as sandwiches, which are delicious. Add some apple sauce if you fancy. Tortilla wraps, lime, avocado, sour cream/yoghurt and cheese – like Pork Carnitas. Homemade potato wedges and coleslaw. Add to tomato sauce and pasta for a pork ragu style dish. Hope you enjoy this recipe as much as we do. I’d love to know how you got on and what you thought of it if you make this Instant Pot Pulled Pork recipe. Please rate the recipe and leave me a comment below if you do. Fancy some other freezer filler recipes? 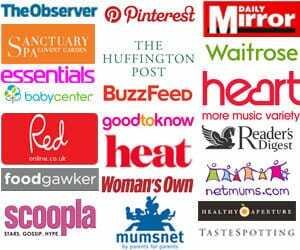 How about my Greek Pork Casserole, Hidden Vegetable Bolognese or my Easy Chilli Con Carne? 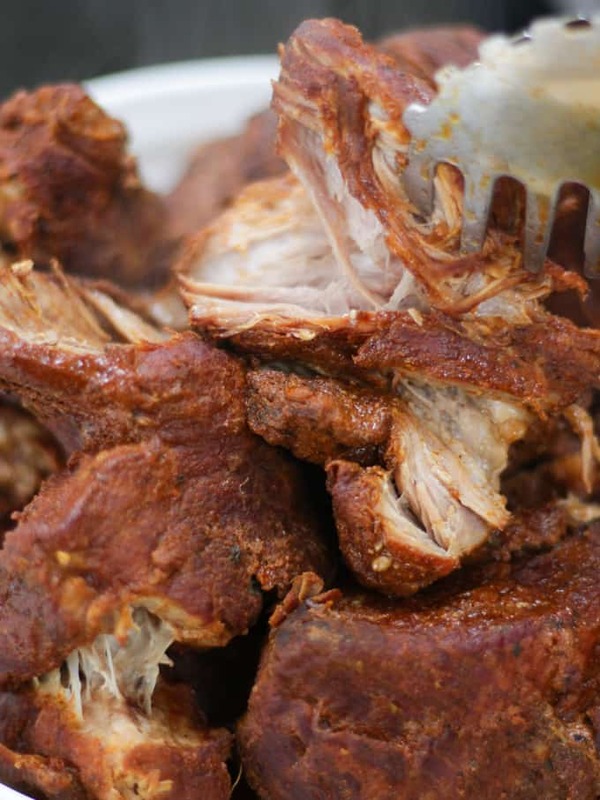 The ultimate Instant Pot Pulled Pork Recipe - A simple tasty rub gives a real depth of flavour to your pork shoulder and helps to create an easy, sticky and delicious homemade barbecue sauce. This is a winning base for so many meals. This pulled pork freezes well too. Stir all of the rub ingredients together and rub all over your pieces of pork shoulder. If you have time, leave to absorb for 30 minutes - 2 hours. Set the Instant Pot to 'saute' mode and heat the olive oil in it. Fry off the pork pieces in batches until golden brown all over. When all of the pork is browned and set to one side, keep the Instant Pot on 'saute' mode and use some of the water to scrape the meat bits off of the bottom of the pan as the water bubbles. Pop the meat back in, leaving the meaty water at the bottom, add the vinegar, honey, tomato puree and the rest of the water. Seal the lid of the Instant Pot and set the timer for 60 minutes. When the Instant Pot is finished, allow it to release the pressure naturally (will take about 15 - 25 minutes). Remove the pork to a bowl and switch on 'saute' mode again. Allow the sauce to reduce by half (you can do this in a saucepan in the hob if you need it to be a little quicker). Meanwhile shred or pull apart the pork into chunks. Add it back to the reduced sauce and stir well. Check for seasoning and add more salt, pepper or honey if needed.